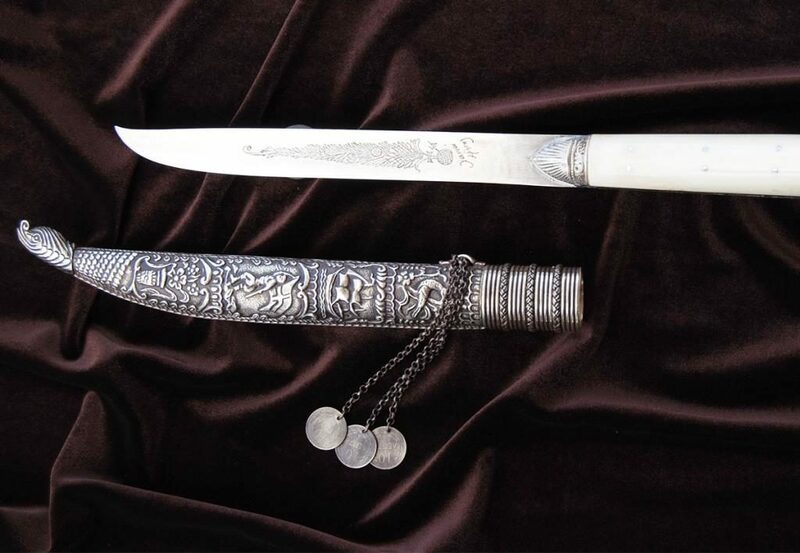 No single historical item represents the Island of Crete more than the Traditional Cretan Dagger. A weapon of honor and gallantry,this work was been realized in an effort to honor and preserve in the memory of modern generations an art in the island of Crete throughout the 19th and in the early 20th century which is slowly and imperceptibly disappearing today, undermined by the pressure of modern technology and the shrinkage of the demand in handy products used by people in their everyday lives in earlier times. It is the art of manufacturing the hand-made Cretan dagger, which has been so much loved by the Cretans, but in a few years will cease to be manufactured in the traditional manner, since faceless technology is gradually replacing the art, skill, mastery and creative enthusiasm of the last Cretan dagger – manufacturers. One of the first tools manufactured by man to help him surviving in the long and difficult era of the dawn of civilization. The dagger is the first edged weapon. In manufacturing, man imitated the shape of the nails of wild animals, with which they catch and kill their prey. One of the most ancient specimens of daggers was found in Gebel El Arak-Egypt. 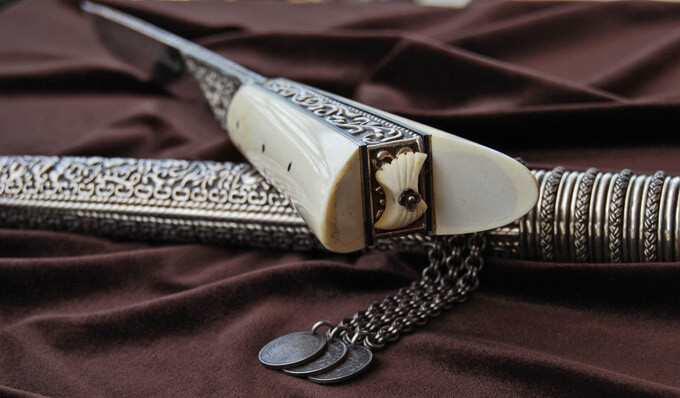 It is made of processed obsidian stone and it has an ivory hilt, decorated with embossed portrayals of scenes inspired by war. This dagger was manufactured circa 3.400 BC and is kept today in the Louvre Museum. However, daggers approaching the age of 5.000 years. Dagger it has been also founded in China, Mesopotamia and Iran’s Luristan. Exquisite double – edged bronze and copper daggers were manufactured in Mycenaean Greece from 1.500 BC onwards, which were brought by merchants motivated by profit to many other distant regions in Europe, since the export trade of weapons thrived during the Mycenaean age. 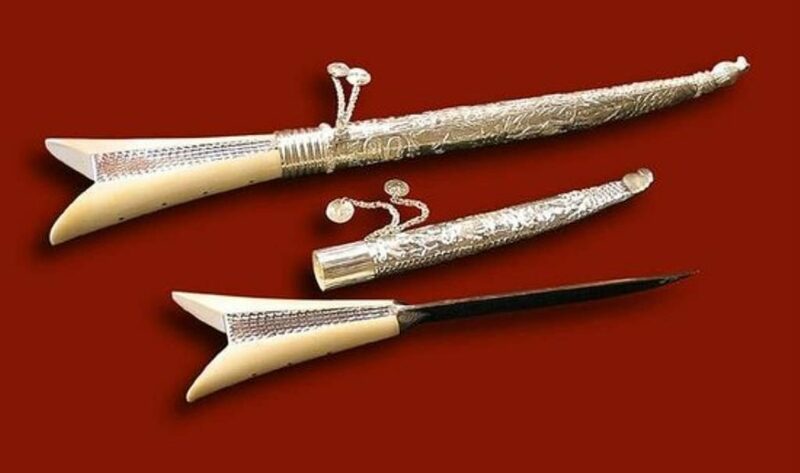 However, in classical Greece too, there was a flourish in the fabrication of numerous edged weapons, mainly daggers, which were used in the innumerable wars that ravaged Greece. In Minoan Greece since 1.500bc and after και they create a different style of bronze knifes and in the same period they inducted the daggers in to the market with the motivation of making profit. They also used to dispatch them in different places in Europe as the exported market has been inducted in the Minoan period with success and it was very popular. At the heyday of Mycenaean civilization, daggers of different quality were manufactured in Minoan Crete, which gave to us many brilliant works of an advanced style. However few specimens have survived to our days. In Crete-Heraklion Archaeological Museum they display a statue of a warrior from Sitia who was armed with a dagger which is very similar with the modern Cretan daggers. It is worth of mention that according to the Greek mythology, the edged weapons and the war helmets were first fabricated in Crete from Kourites followers of the god Zeus’s were considered to be their inventors. 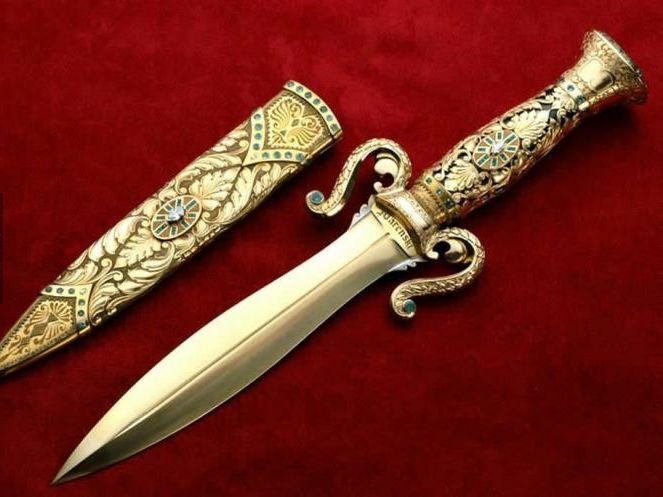 The Cretan dagger, companion of every Cretan in the old times, accompanied the Cretans wherever they went, either as travelers or as immigrants, when in hard times some of them were forced to abandon their beautiful island. The Cretan dagger can be found not only in Crete and in the other regions of Greece, but also at the ends of the eartt, from Egypt to Russia and from the U.S.A. and Canada to Australia, either in the houses of Cretans as a valuable antique, or in second – hand and antique shops, dusted and without identity, among a heap of disparate objects, waiting for the person that will recognize and obtain it, paying a certain amount in consideration. Each of them hides its own story, humble or glorious, connected with the island of Crete and Cretan gallantry. The dagger is decorative, defensive and today it is an essential part of the traditional costume of Crete. 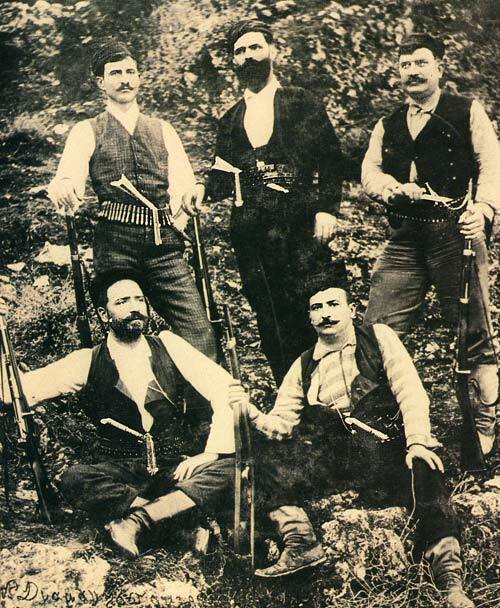 All male Cretan dancers wear a traditional dagger as part of their costume. Passionate with Cretan History, exploration of Crete's traditional facts.Welcome to Our Blog and hope you enjoy the articles.